Meatloaf for breakfast? Yes, it really is a thing! 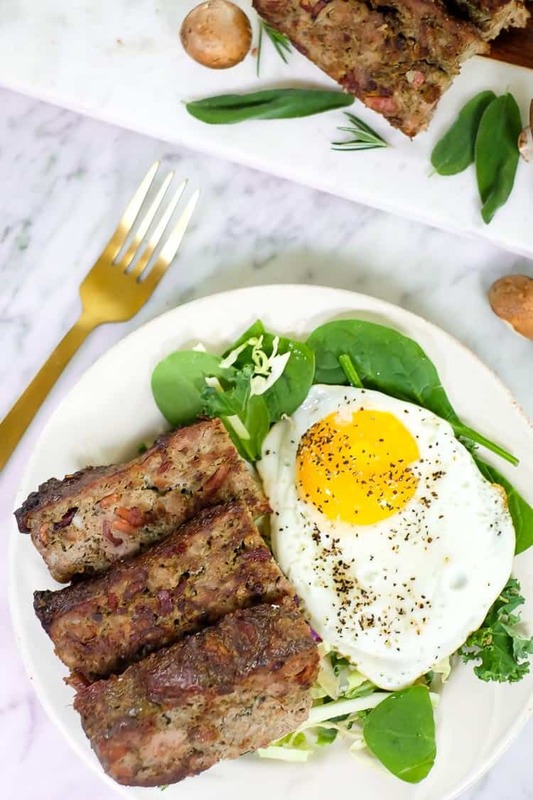 This breakfast meatloaf with bacon is so savory and delicious you’ll want to devour it the second you crawl out of bed (at least that’s how I roll). You guys should know by now that we are all about meal prep and planning. Basically, that’s the whole point of our Meal Plans. 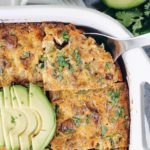 Taking a little extra time over the weekend to make up a batch of this breakfast meatloaf is truly worth it. When you already have a delicious meal waiting for you in the morning, doesn’t that just make life a little easier? 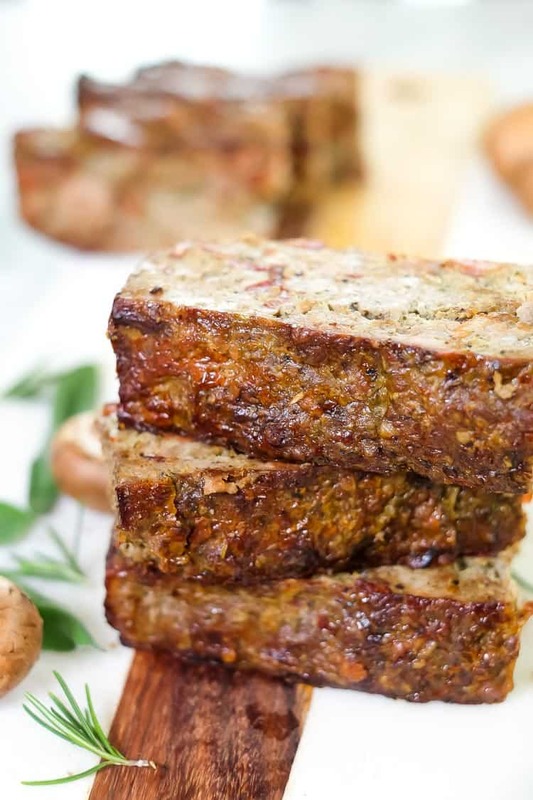 We added bacon to this meatloaf to kick it up a notch in flavor. 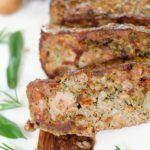 You could really eat this meatloaf any time of day, but with the bacon in it it really makes it feel like a breakfast meatloaf. We like to make a batch, slice it up and have it ready in the fridge to reheat in the morning. Our favorite way to eat it is over a bed of greens with an egg on top – simply delicious. 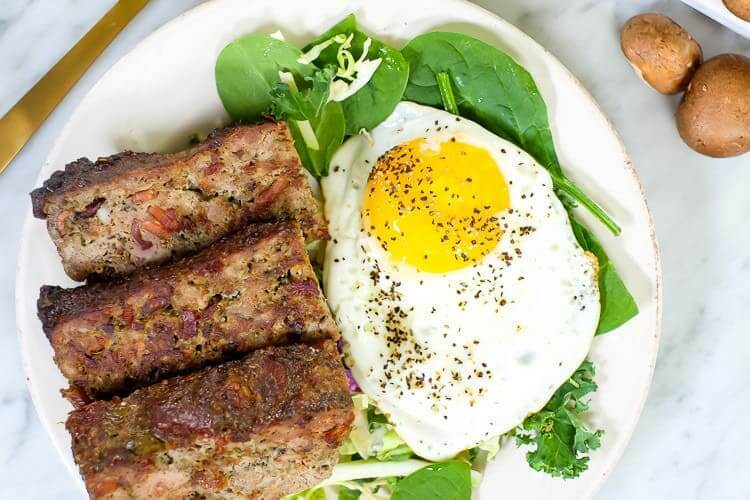 This breakfast meatloaf cooks for an hour in the oven, but it really only takes about 20 minutes of active prep time. If you have a food processor, it will cut out half of the work and make chopping up the onion, garlic, mushrooms and fresh herbs a breeze. 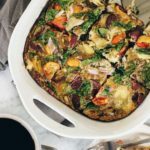 Just mix in the chopped veggies and herbs with the sausage, beef and bacon and soon you’ll be enjoying some delicious smells coming out of the oven as the breakfast meatloaf cooks. 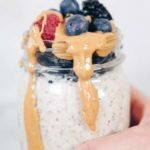 Ready for a delicious and breakfast? 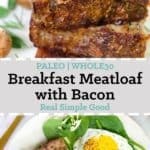 Try out this breakfast meatloaf with bacon! 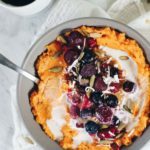 Make it for a brunch or prep it over the weekend to have on hand for an easy breakfast during the week. Then, let us know what you think by leaving a comment below. Also, take a photo and tag us on Instagram @realsimplegood, so we can check it out! Meatloaf for breakfast? Yes, it really is a thing! 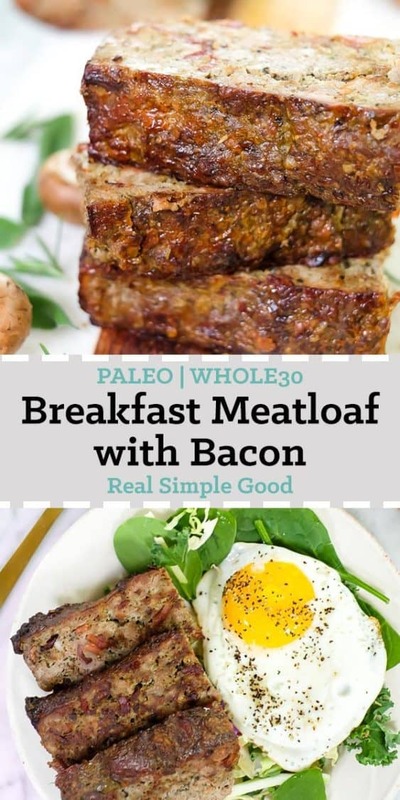 This paleo and whole30 breakfast meatloaf with bacon is so savory and delicious you'll want to devour it the second you crawl out of bed. 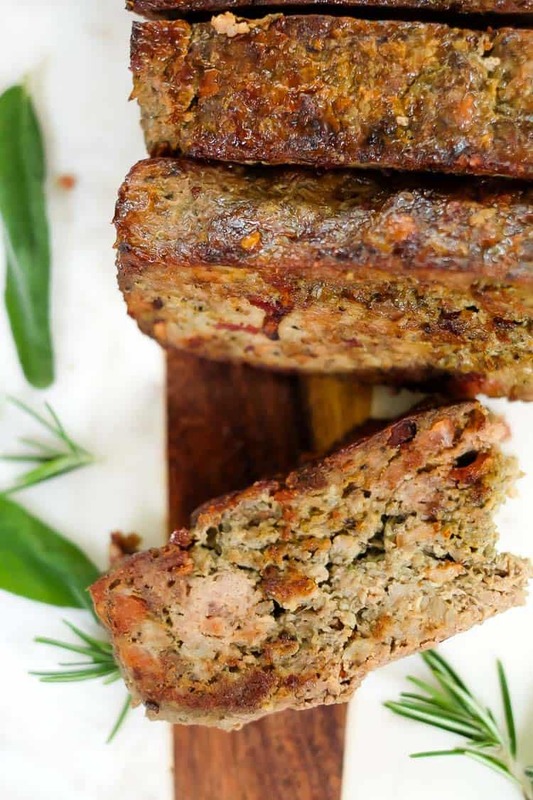 Ground beef, sausage, bacon, vegetables and fresh herbs make this a savory breakfast delight! Dice bacon and heat a skillet over medium heat. Add bacon to cook, stirring occasionally. Remove bacon just when it is starting to get crispy around the edges, about 6-7 minutes. Remove and place on a paper towel lined plate. While the bacon is cooking. Preheat oven to 400° Fahrenheit. Lightly grease a 8x8 baking dish with butter or ghee. Place garlic, onion, mushrooms, sage and rosemary in a food processor. Process until everything is diced into small bits. Alternatively, you can chop everything up into small bits by hand. 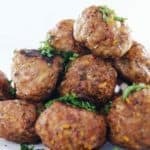 Place beef and sausage in a bowl. To the bowl add the eggs, chopped veggies, salt, pepper and cooked bacon. Use your hands to mix ingredients together well. Add the meatloaf mixture to the baking dish and spread it out evenly. Place in the oven to bake for 1 hour. Remove and allow to cool at least 5 minutes before serving. We like to serve this over greens and topped with an egg. 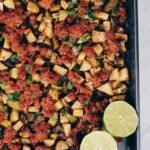 Love this recipe I added a 1.5 lb of pork instead of the breakfast sausage! I also greased my pan with the leftover bacon grease after cooking the strips of bacon. It’s so delicious! This is one of my favorites too! So glad you liked it and thanks for coming back to leave a comment :). I love your recipes but there are a lot of mushrooms in your recipes. Since I can’t have them, can you recommend a good substitute or just leave them out? Thanks! For this recipe you could leave them out. If you are looking for a substitute, sometimes eggplant can work.